Irish whiskey is one I like to do with tea. In fact I like to make an Irish coffee by substituting the coffee with a strong black tea. Try it! I am rather fond of it. Gunfire is a classic British rum and black tea cocktail, with a German equivalent in the Jagertee. Two European great powers can't be wrong - go with the rum! Wild Turkey American Honey is excellent with most kinds of tea including black, green, and orange pekoe. Throw in a squeeze of lemon for an delicious, easy to make, and modern twist on the Hot Toddy. Another alcohol that pairs well with tea is tea flavored vodka. There are lots of different brands of this such as Firefly and Jeremiah Weed, and typically in bars they are paired with iced tea, they work equally well with hot tea. Finally, Fireball or other Cinnamon Whiskeys go well with Tea also, but they can often overpower less potent teas. Once I helped out as bartender, a girl asked for green vodka with green tea. My father sometimes adds Rum to it. 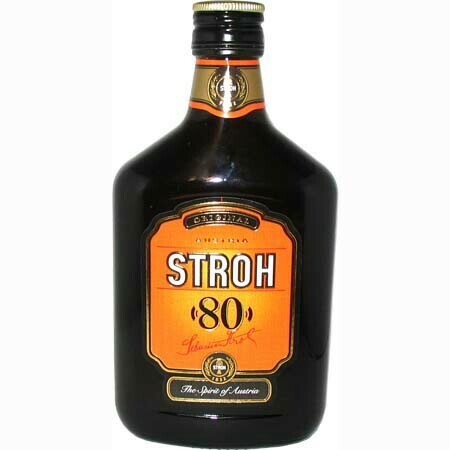 Preferably German Strohrum (straw rum). If you like the floral taste of earl grey tea, you might enjoy adding a splash of St. Germain elderflower liqueur and a lemon twist to black tea. The very refreshing Rosa Mae cocktail combines black tea, gin, honey and lime. I'm currently sipping a hot toddy made with lemon & ginger herbal tea, honey, and a local whiskey. It's very soothing on a sore throat. Tea and beer can be a great combination. I have a blog post here about some tea beers that I made in cooperation with a local brewery. The combination of cinnamon orange spice tea with a hefeweizen worked especially well, as hefes are often served with a slice of citrus. I took a class a few years back on pairing tea with whiskey (or whisky). They were focused on serving the whiskey and tea separately rather than blending them, but blending can work nicely. I'm a fan of smokey malty Scotch — mostly the Islays — and it blends nicely with a powerful black tea. If you really dig the smoke flavor, blend an Islay Scotch with a lapsang souchong or Russian Caravan tea. If you like citrus flavors in your tea, try using a splash of Triple Sec or Cointreau. In Northern Germany they handle it in the following way. First they take rock candy and put it into a glass. It can be brown or white rock candy. The glass is filled up with brown rum which has a Vol% between 38 and 40 of alcohol. It is possible to mix and use it immediately, but most people just put it aside for a while. After some time the fluid of rum becomes glutinous and the surface of the rock candy becomes soft. When this mixture is in that status they put some spoons of it into the cup and fill it up with black tea. Could be from Ceylon or comparable. When filling up with the hot tea the rock candy crashes internally and when mixing up the tea with it all it becomes a wonderful experience especially in wintertime. I would avoid alcohol in tea, its so much better in coffee! I put any bad whisky (grouse etc) in plain old instant coffee with a bit of caster sugar and thats nice. If you want to be more adventurous then make a strong black coffee, preferably espresso and add a shot of Irish whisky, a shot of baileys (or equivalent) add one teaspoons of sugar and a little whipped cream to your taste. The result is well worth the effort! I dont personally drink caffeine so I do all this with decaf and its still amazing! Ciroc red berry vodka and homeade lipton ice tea is delicious. Not the answer you're looking for? Browse other questions tagged taste recommendations drinking or ask your own question. How much actual alcohol is safe to drink per day?